Sachin Saga Cricket Champions Is Now Available For Download On Google Play Store. 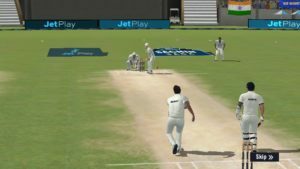 Can This Game Compete With WCC2? Surely Not!! Find Out The Answer Why!! Sachin Saga Cricket Champions Is An Online Game. You Can Not Play It Offline. This Is One Of The Stupid Feature. WCC 2 Can Be Played Offline But Not Sachin Saga. Also, See – Captain Tsubasa, Football Game Overview[New Game]. In Sachin Saga, There Is A Lack Of Content In Comparison To WCC 2. This Cricket Game Comes With Legendary Mode In Which You Follow The Journey Of Sachin Tendulkar. You Have To Complete The Task Or Target. For Instance – Score 27 Runs Off 30 Balls. To Unlock Event Mode, You Have To Complete First 6 Matches Target In Legendary Mode. Event Mode Is Good In Which You Build You Team[11-Man Squad In Up To 50 Over Matches] And Compete With Real Players In The Game. The Only Difference In Sachin Saga Beta Version And Public Version Is – Sponsor Ads. Beta Version Comes Without Sponsor Ads And Public Version With Sponsor Ads. Not. There Is A Stamina/Energy System. Each Match Costs You Energy. Once You Spent, You Have To Wait For Restore Or Use Diamonds. If You Win The Match, You Will Get Reward. There Is A Practice Mode Also-Go To Home Section Of The Game. Initially, It Is Locked. To Unlock You Have To Complete Some Levels Of Legendary Mode. Gameplay – It’s OK. Graphics – Graphics Are Not So Impressive. Replay Mode In This Game Is Great. WCC 2 Is Far Better Than Sachin Saga. Tips – You Have Limited Energy. So, Give Your Best To Complete Legendary Mode’s Level In 1 Turn. If You Get Defeated, You Will Lose Energy/XPs. But If You Win, You Will Get Rewards. Should You Download? – Yes!! This Game Is Specially Made For Sachin Fans. You Have The Chance To Explore How A 16 Year Old Sachin Become A Legend. In Legendary Mode, Follow The Journey, And Play Sachin’s Glorious Career Of 24’s Years. Price – Free, Size – 91 MB, Status – Released. Download – Here[Google Play Store].